And when the sabbath was past, Mary Magdalene, and Mary the mother of James, and Salome, bought spices, so that they might go and anoint him. And very early on the first day of the week they went to the tomb when the sun had risen. And they were saying to one another, “Who will roll away the stone for us from the door of the tomb?” And looking up, they saw that the stone was rolled back; for it was very large. 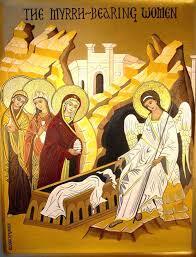 And entering the tomb, they saw a young man sitting on the right side, dressed in a white robe; and they were amazed. And he said to them, “Do not be amazed; you seek Jesus of Nazareth, who was crucified. He has risen, he is not here; see the place where they laid him. But go, tell his disciples and Peter that he is going before you to Galilee; there you will see him, as he told you.” And they went out and fled from the tomb; for trembling and astonishment had come upon them; and they said nothing to anyone, for they were afraid. About the beginning of His thirty-second year, when the Lord Jesus was going throughout Galilee, preaching and working miracles, many women who had received of His beneficence left their own homeland and from then on followed after Him. They ministered unto Him out of their own possessions, even until His crucifixion and entombment; and afterwards, neither losing faith in Him after His death, nor fearing the wrath of the Jewish rulers, they came to the sepulchre, bearing the myrrh-oils they had prepared to annoint His body. It is because of the myrrh-oils, that these God-loving women brought to the tomb of Jesus that they are called the Myrrh-bearers. Of those whose names are known are the following: first of all, the most holy Virgin Mary, who in Matthew 27:56 and Mark 15:40 is called “the mother of James and Joses” (these are the sons of Joseph by a previous marriage, and she was therefore their step-mother); Mary Magdalene (celebrated July 22); Mary, the wife of Clopas; Joanna, wife of Chouza, a steward of Herod Antipas; Salome, the mother of the sons of Zebedee, Mary and Martha, the sisters of Lazarus; and Susanna. As for the names of the rest of them, the evangelists have kept silence (Matt 27:55-56; 28:1-10. Mark 15:40-41. Luke 8:1-3; 23:55-24:11, 22-24. John 19:25; 20:11-18. Acts 1:14). Together with them we celebrate also the secret disciples of the Saviour, Joseph and Nicodemus. Of these, Nicodemus was probably a Jerusalemite, a prominent leader among the Jews and of the order of the Pharisees, learned in the Law and instructed in the Holy Scriptures. He had believed in Christ when, at the beginning of our Saviour’s preaching of salvation, he came to Him by night. Furthermore, he brought some one hundred pounds of myrrh-oils and an aromatic mixture of aloes and spices out of reverence and love for the divine Teacher (John 19:39). Joseph, who was from the city of Arimathea, was a wealthy and noble man, and one of the counsellors who were in Jerusalem. He went boldly unto Pilate and asked for the body of Jesus, and together with Nicodemus he gave Him burial. Since time did not permit the preparation of another tomb, he placed the Lord’s body in his own tomb which was hewn out of rock, as the Evangelist says (Matt. 27:60). Though You went down into the tomb, You destroyed Hades’ power, and You rose the victor, Christ God, saying to the myrrh-bearing women, “Hail!” and granting peace to Your disciples, You who raise up the fallen.